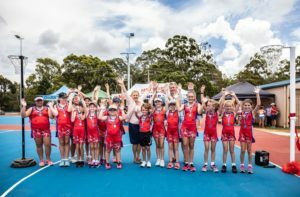 Mayor Karen Williams officially opened renewed netball courts at Keith Surridge Park, Alexandra Hills on Saturday 2 February 2019, scoring another goal for sport on Redlands Coast. One of four projects under Council’s Renewal Program – Sports, the renewed netball court facilities include two concrete netball courts with sports surfaces, line marking, netball posts and nets to competition standard, new turf and fencing, lights, tiered seating, and a concrete path linking the Bombers AFL and Meteors Netball clubs. Cr Williams said Council had invested approximately $500,000 at Keith Surridge Park to complete the project. “Other projects within this program include the renewal of two multi-purpose courts at Ron Stark Oval, Dunwich, which was completed before Christmas, the renewal of the Rage Cage at John Fredricks Park, Capalaba and the renewal of the court facility at Pioneer Park on Lamb Island, which are planned to be undertaken before the end of this financial year,” Cr Williams said. “Sport is an important part of the community on Redlands Coast and we all love the sports facilities and open spaces we have here. 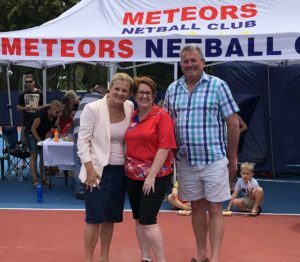 Mayor Karen Williams, Division 7 Councillor Murray Elliott, and Meteors Netball Club players celebrate the opening of the club’s renewed courts. Councillor for Division 7 Murray Elliott said the renewed netball courts were a welcome addition to the Alexandra Hills community. “Critical works on this project included removal of existing cricket nets, the reshaping of an unusable embankment, and the installation of blocks to create a safe, tiered seating area, as well as high performance court surface and the installation of LED lighting with capacity to increase the number of light fittings,” he said. “These projects under Council’s Renewal Program – Sports will no doubt bolster the community’s strong commitment to the development of local sports people. Mayor Karen Williams and Division 7 Councillor Murray Elliott with Meteors Netball Club president Liz Heagney.